Lately I have been on a turquoise fountain-pen-buying binge. One of my purchases was the Platinum 3776 Kumpoo fountain pen with a soft medium nib. The pen comes in a turquoise outer cardboard box and white, clamshell inner box. 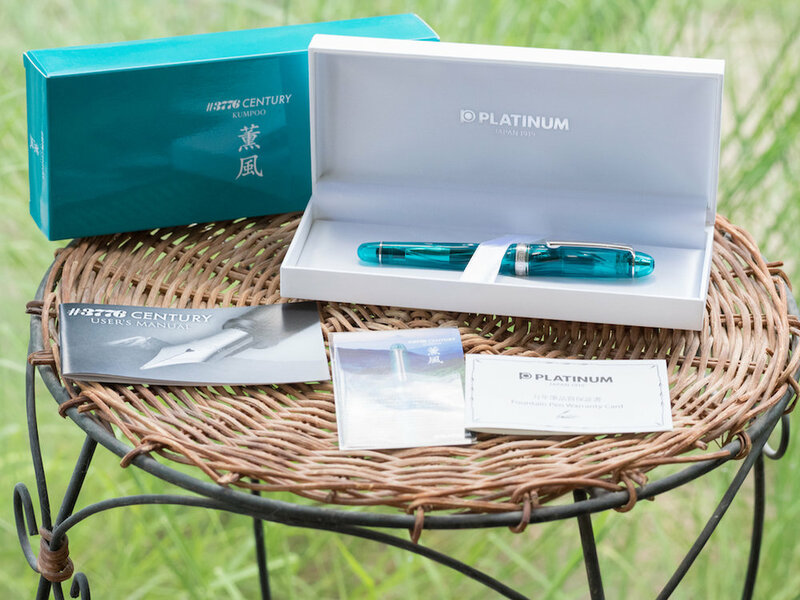 Included are a Platinum pamphlet, a warranty card, a blotting card with a description of the pen, and one cartridge. “Kumpoo” is a Japanese word that means “balmy breeze.” The Platinum 3776 Kumpoo fountain pen is designed to evoke the breezes that blow around Mt. Fuji in Japan. 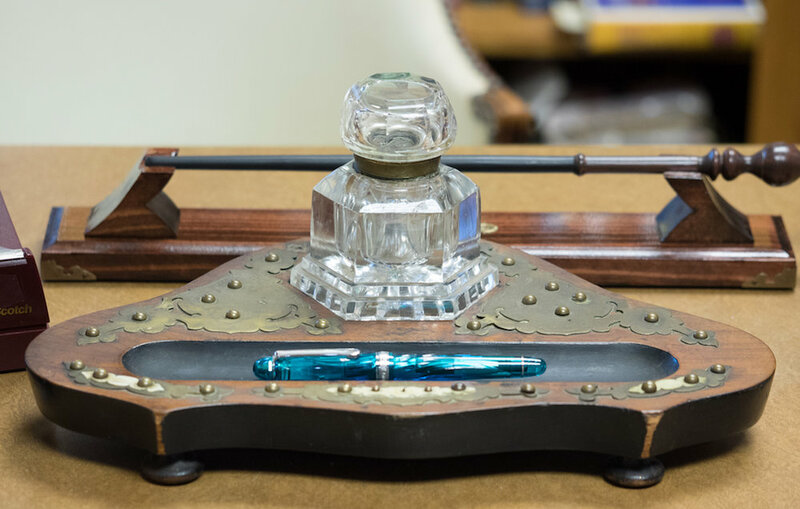 Thus, the pen’s surface is carved with waves that represent those balmy breezes and the color of the pen reflects the beautiful skies surrounding Mt. Fuji. Even the metal piece in the finial is a tribute to Mt. Fuji. Each pen cap is engraved with a limited edition number. Mine is 1551 out of 2500. The pen is medium-sized at 5.5 inches/139.7mm capped, 4.7 inches/119.8mm uncapped, and 6 inches/152.4 posted. It weighs only 24.3 grams. The pen fills via cartridge or the included converter. 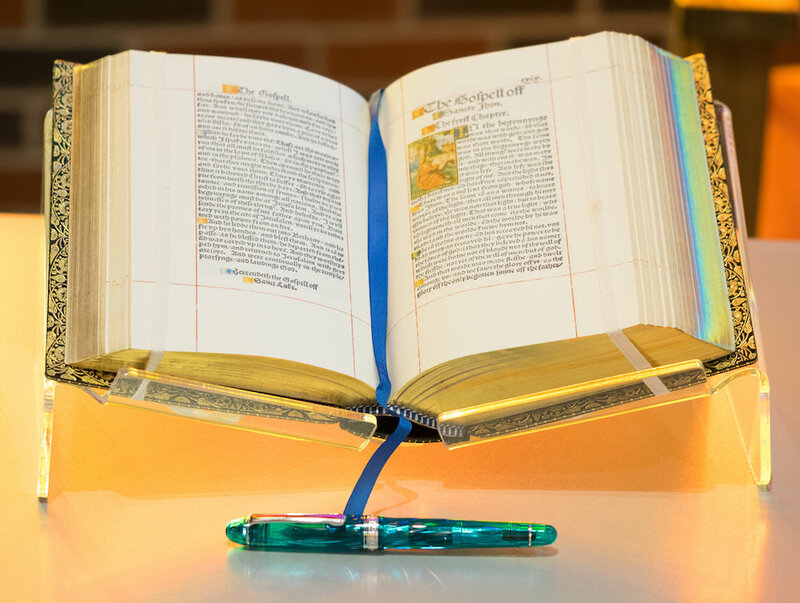 Platinum converters only hold 0.5ml of ink, so expect to refill it often if you write lengthy tomes. One thing I like about Platinum converters is, if the converter gets sticky over time, you can disassemble it and use silicone grease to get it working properly again. I chose a medium-soft 14k nib. Platinum nibs are much more narrow than Western nibs, so a medium is really like a Western fine. I have several Platinum 3776 pens, and my favorite size nib is the medium. The soft-medium is especially nice. It gives the nib some spring while you write, but it is not meant to be a flex nib, so there’s little line variation. Writing with the Kumpoo is a pleasure. The nib is smooth and bouncy, and the pen itself is comfortable in the hand. Since Platinum nibs and Nakaya nibs are made by the same manufacturer, you can enjoy the experience of a Nakaya in a much less expensive pen. I really love my Platinum Kumpoo. It’s a beautiful pen, especially with the added texture, which picks up light and makes it stand out from standard Platinum fountain pens. I owned an Omas Ogiva in turquoise with an extra flessibile nib. I wanted to love that pen because I paid an awful lot for it; plus it was a piston filler. But, the Omas was frustrating from the beginning--ink kept leaking into the grip section and the pen would dry out quickly. The Kumpoo is just as beautiful as the Omas, and even though it isn’t a piston-filler, the Platinum “slip and seal” mechanism in the cap means that the pen does not dry out. The soft-medium nib might not have flex, but it offers one of the best writing experiences. Unfortunately, finding a Platinum Kumpoo may be pretty difficult now. All the dealers I checked (Goldspot, Goulet, JetPens, nibs.com, Pen Chalet, and Vanness) were out of stock. That said, Platinum is apparently producing several pens in the Fuji Shunkei series (the first was the Shungyo and the second is the Kumpoo). So, even if you can’t get this particular limited edition, hopefully new editions will be added to the series. In my opinion this is one of the most beautiful iterations of the Platinum 3776 series because of the textured surface and the color. I love all the symbolism the creators included in the pen. The pen is a good size for most users and is very light. The soft-medium nib is my favorite nib. It is smooth and bouncy and writes perfectly. Writers who prefer pens with heft will probably think the Platinum is too light and plasticky. The converter only holds 0.5ml of ink (though cartridges hold 1.5ml). Unfortunately, the Kumpoo seems to be sold out or nearly sold out, so if you want one, you’ll need to keep your eye on sales at pen forums or eBay. Posted on August 31, 2018 by Susan Pigott and filed under Platinum, Fountain Pens, Pen Reviews. I received the Masuya Monokaki Pocket Notebook several months ago from JetPens, but I have so many notebooks, I hadn’t had a chance to use it until now. The pocket notebook is an interesting size (14.0 cm /5.5 inches in length and 8.6 cm /3.4 inches in width), and it has 64 sheets printed on both sides with 0.7mm graph lines. The notebook has a soft cardboard cover with a cool design on the front, and it is thread and glue bound. The cream-colored paper is fountain-pen friendly, but it is also very thin, so if you don’t like your writing to show through, you will not like this paper. 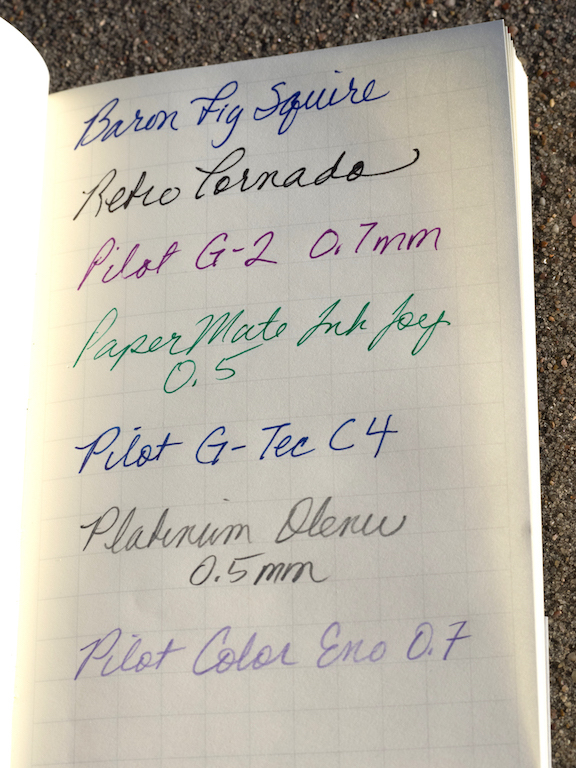 I tested it with several different nib sizes and inks. There was no feathering or bleed-through. However, as you can see in the second photo below, there’s plenty of show through. I also tested the paper with various gel pens, rollerballs, and pencils. It works well with all of them, but, once again, show through is obvious. The Monokaki notebook is the perfect size for purses, satchels, and backpacks. But, the soft cover is easily bent, so you’ll want to put it in a pocket or sleeve to protect it. The notebook does not lay flat when open, which is a weakness. 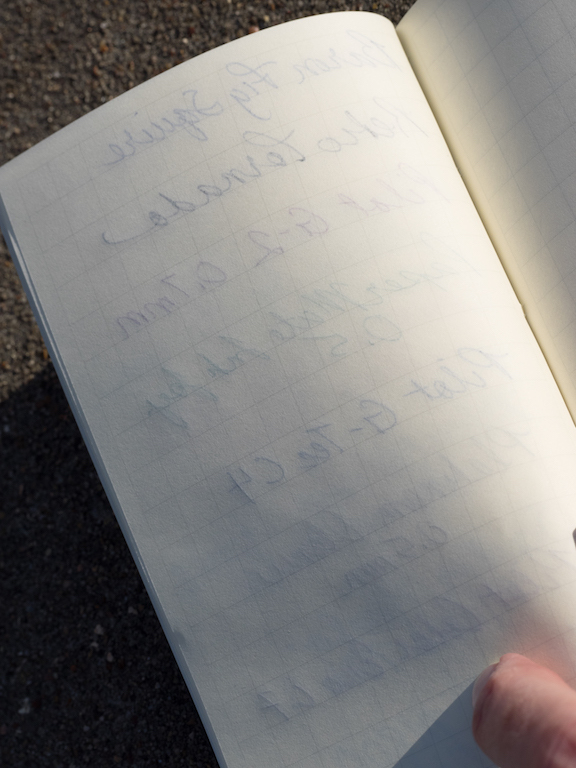 The 7mm graph lines almost seem too large for a notebook this size, and since show through is unavoidable, you probably won’t want to write on both sides of the paper. You will get the best results from fine nibs and/or pencils. You can purchase the Monokaki Pocket Notebook from JetPens for $7.75. The Platinum Plaisir fountain pen is an aluminum pen with a stainless steel Preppy nib. 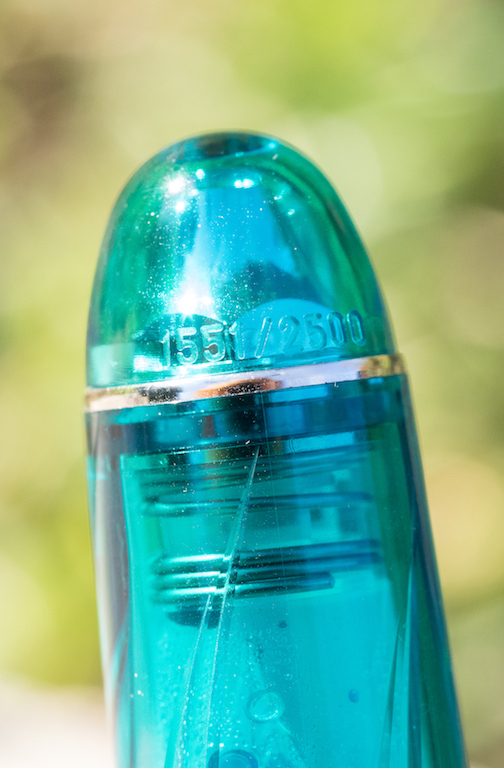 It is available in a wide array of colors that have a beautiful iridescent finish. The pen comes with one black Platinum cartridge (which is proprietary, so you’ll have to buy extras), but you can use a Platinum converter (not included) if you prefer. I wanted to use an orange ink with my Plaisir, so I put in a converter. The Platinum Plaisir is an inexpensive pen at $14.25. That’s not bad for a metal pen. It’s comfortable to hold, especially since the grip is plastic not metal. It’s a small pen unposted (4.8 inches). Posted it is 5.8 inches, and capped it is 5.6 inches. The grip is transparent, so you can see the ink filtering down to the nib. Although you can remove the nib to clean the pen, the ink pools in the threads in the grip, and it doesn’t rinse out so easily. The cap snaps on securely and it is postable. It’s got a basic steel clip and a large steel cap ring with the words “Platinum Plaisir Japan.” The pen is quite beautiful. The fine nib is smooth but rigid. I tested it with Kyo-iro 04 Higashiyama Moonlight (reviewed here), and that ink was simply too dry for this fine of a nib. 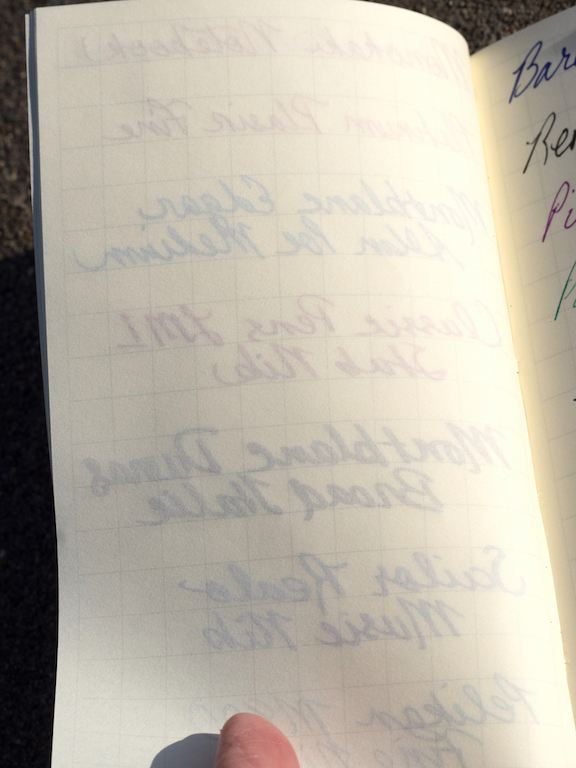 Iroshizuku Fuyu-Gaki flowed much better. Although the pen is meant to be rugged, I noticed dents in the body and scratches. This pen has not been roughly handled, and I didn’t let it loose in my purse where it could get scratched. I think the dents may have come from posting the cap. Regardless, the pen is definitely not as durable as you might expect. The Platinum Plaisir comes in a whole rainbow of colors and you can get each color with either a fine or medium nib. You can purchase the Plaisir from JetPens for $14.25. The Monokaki Pocket Notebook and Platinum Plaisir are a perfect match for one another if you are looking for an everyday carry set. Posted on April 6, 2018 by Susan Pigott and filed under Monokaki, Platinum, Pen Reviews, Notebook Reviews.